The 25 cubic yard or 60,000 pound capacity trailer has a base weight 1,000 pounds lighter than the standard model, giving the user more payload capacity. XL Specialized Trailers displayed their new prototype Bottom Dump design at ConExpo-Con/AGG 2017. The 25 cubic yard or 60,000 pound capacity trailer has a base weight 1,000 pounds lighter than the standard model, giving the user more payload capacity. The steel design of the XL Bottom Dump is durable, using reinforced sidewalls made from 1/8-inch Hardox steel and gates made from 3/16-inch Hardox steel. The hopper specs make hauling and delivering a variety of materials an efficient process. 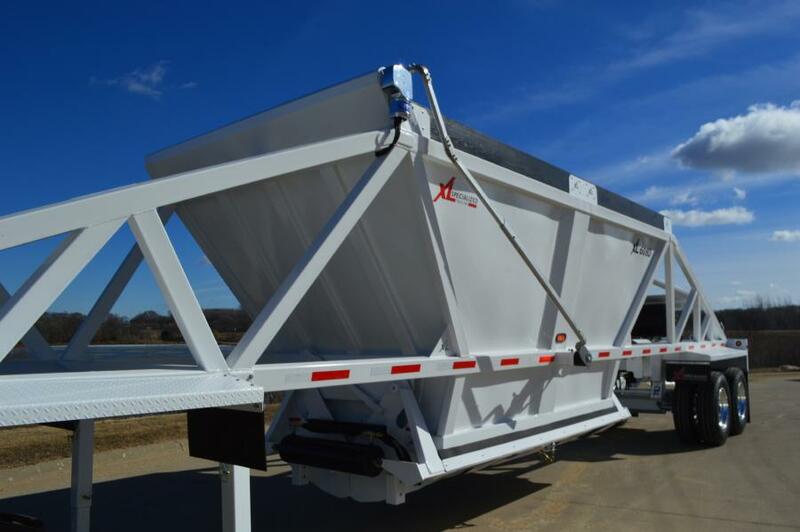 With an opening of 96 inches by 193 inches, the XL Bottom Dump offers the largest hopper opening available on the market. An infinite gate control allows users to open the gates to any width, giving them more control when unloading material. Adjustable side locks and windrow deflectors assist in dumping various materials. The air-operated gates include an electric cab control and manual air valve, which can be controlled from the ground. The oscillating 5th wheel plate pivots as needed to pull the trailer over large piles. User-friendly features include a bolt-on removable push block, bolt-on access ladders and steel tread plate fenders on the front and rear decks. XL offers many tarp options to suit drivers' needs: front to back roll tarp, manual flip tarp, electric flip tarp or a manual slide tarp. The prototype at this year's ConExpo-Con/AGG will move on to its next phase of testing following the show, getting put to work out in the field. After sufficient testing, the new XL Bottom Dump will go to market — giving drivers a lightweight steel bottom dump option. For more information, visit www.xlspecializedtrailer.com.